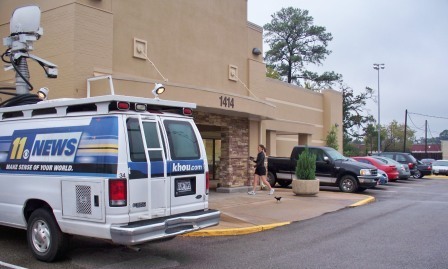 Good morning and welcome to election day in Harris County, Houston Texas. Today I will be traveling around the county visiting polling locations to let you see what is happening across the county. Many important issues are on the ballot. 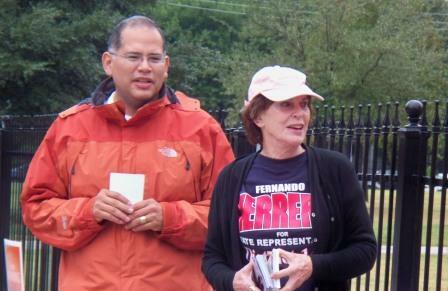 Will Fernando Herrera pull off upset victories over their well entrenched liberal incumbent opponents? Will Prop 1 go down the drain? 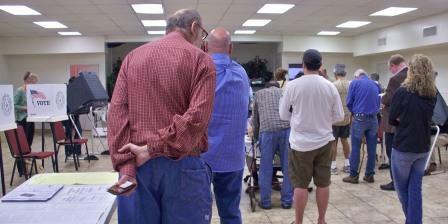 What will happen with the poll watchers and the people watching the poll watchers? 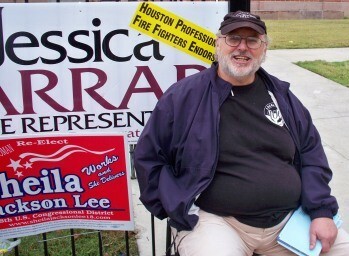 Will John Faulk retire Sheila Jackson Lee? All these questions and more will be answered before the end of the day! Tonight I will bring coverage from some of the victory parties going on around Houston. It is going to be a long and fun day! Hang on and let's go for a ride! Starting at my home precinct, The 805, I found a short line of voters. At precisely 7:00 the doors opened to a slightly wet group of voters who were quickly processed and the day's voting began! Stopped in another location where a friend of mine is running her first election as a Presiding Election Judge. Congrats Melissa and thanks for choosing to serve! 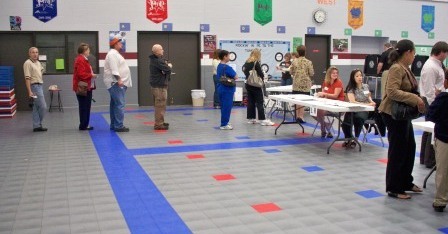 This precinct had more machines and a longer line of voters. A stead stream of voters were walking through the darkness and rain to cast their votes. Saw the first candidate volunteer of the day as one of the ladies married to a school board candidate braved the weather with her umbrella to help her husband get elected. 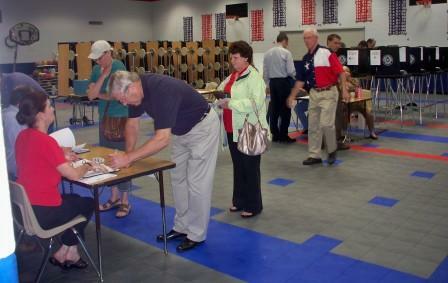 At the wirt road polling location, three precincts were combined to one voting location. As confusing as that might sound, things seemed to be running very smoothly. 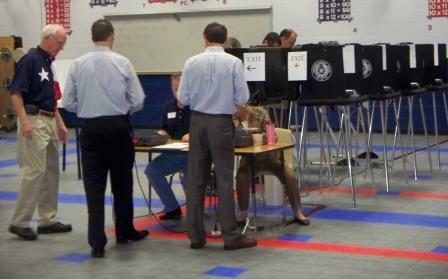 Election officials were working in the hallway to help voters determine if they were at the correct location and if not, send them in the right directioin. Outside was a Channel 11 news truck, but I didn't see much happening there. 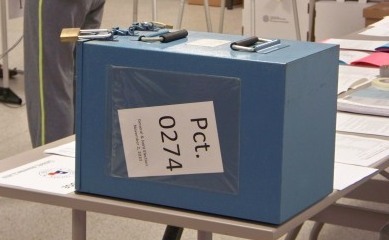 I did see something I hadn't seen before... A BALLOT BOX! Perhaps they were anticipating something later. On the way there I ran across a home who hs the right idea on signage! After the insightful lecture from the precinct nativist union dude at Reagan HS, I moved on to another location in the Heights. There I found a very smooth running operation and had a conversation with a poll watcher who was pleasantly surprised to see how well things were going at that location. Hats off to the judges here. Mid afternoong found me on the East Side of Houston checking out reports at Ripley House that a group known as La Familia Vote was disrupting the polling location at Ripley House, electioneering inside the building. When I got there it was over, but I spoke with the election judge, a very nice 72 yr old lady. She said they were right outside the polling room wearing their t-shirts and handing out flyers. When she told them they couldn't do that, one of them told her, "you're tool old, lady. You better be careful." They finally left. The incident was reported to police for investigation. 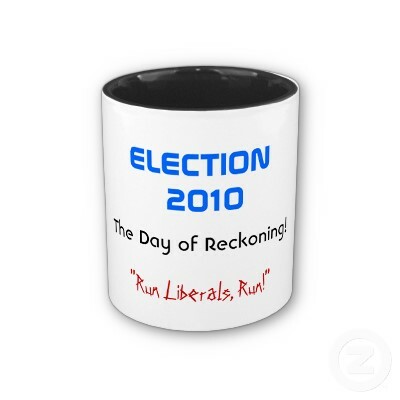 Another man wearing a Democrat shirt was seen, again, inside the building near the election room. He was wearing a Democrat shirt and had a clipboard full of electioneering materials. He was asked to leave and waited quite a while before complying. I will have pictures of him tomorrow. Then on to PCT 11 also on the East side. At this location, all of Herrera's signs had been stolen and they were putting out their third batch for the day. When I left there, a representative of the Secretary of State's office had just left responding to complaints about how this election site was being run. When I arrived I noticed a candidate worker sitting inside the restricted zone with a Bill White sign. 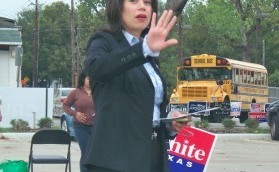 State Representative Carol Alvarado attempted to block me taking pictures of the offense. I am not sure why as they never moved, even after talking to the judge. I looked around the facility and could only find one 100' distance marker. It was located about 50 feet or so from the entrance to the election room in a direction no one approached from. I asked the judge where the boundry signs were. He said they were all over the place. So, I walked around again and found no other signs. I spoke with him about this and he said he told the candidates the light pole in the picture below was the boundry marker and he had specifically told Ms. Alvarado about this. I told him she was electioneering well within that distance (which he could see from where we were sitting and he smiled and said, "Yes, she is." I then walked around with the video camera documenting the lack of signs and illustrating Ms. Alvarado (who should know what the law is, regardless of signage) well within the boundry talking with a new batch of voters who had just parked. (video will be up tomorrow. Please come back). Ms. Alvarado asked me why I was videoing the boundry areas. I told her the judge told me that he had informed her of the light pole being the boundry marker. She smiled and said, "I forgot". Herrera's signs were all stolen twice this day. When I arrived volunteers were putting out a new batch of signs. Voting was VERY light on Houston's east side. As the sun set on the election I visited three precincts in the northern part of Sheila Jackson Lee's district. I witnessed something very different here. There were no campaign workers present. Okay, you are probably thinking, well duh, its the very end of the day and people went home, right? At all three of these locations, there had been no candidate volunteers (from either party) and there had been no poll watchers. Very odd. At one of the locations, at a high school, there were no distance markers at all. I asked the judge about that and he said they had been stolen. I guess that's possible at a high school. THen while we were talking, a voter walked by on their way out and he said to the voter, "Thanks for voting, please go get 10 of your friends and come back." An odd combination of his two jobs of election judge and precinct chairman... I wonder what he had been saying when I wasn't there. Shortly after that I learned of a story about a friend of mine who had been working at an Alternate Election Judge on the south side of town, being told to leave by the Presiding Judge and escorted out by police. But that, as they say, is a whole 'nother story which I will present for you later on Wednesday! I started the day looking for a "flock of geese flying by" moment. I never found it, but I did find a whole lot of squirelly Democrats who just seem to think they are above the law. Or, if not above it, that it just doesn't seem to apply to them. With the reports out of Dallas, and things I have observed and heard about in Houston, we have real problems with the election process. There does not seem to be enough training of election workers. Some judges I observed seemed rather timid about enforcing the rules and laws governing the election and that is their job. This to is another story to delve deeper into over the next few weeks as we kick off the start of yet another election cycle (city elections). Thank you for following our coverage of this election. There is still more to come and some of it is quite shocking. Stay tuned to TexasGOPVote!